It’s hard to improve on our chocolate treats from Hawaii, but enjoying them with a cup of tea makes them even more scrumptious. Tea and chocolate pair perfectly together. The crisp, clean flavor of tea is the perfect complement to smooth, rich chocolate. For the most enjoyable experience, here are a few pairing suggestions to try. Dark chocolate covered macadamia nuts taste even richer when paired with green teas that have a toasted flavor. You can also enjoy these chocolate treats with a floral oolong tea, which tends to enhance the more subtle flavors in the chocolate. Milk chocolate covered macadamia nuts taste especially creamy when paired with a spicy chai tea. To bring out the flavor of the macadamia nuts, try sipping a nutty, roasted green tea. White chocolate covered macadamia nuts have a mildly sweet flavor that’s enhanced by a rich green tea, such as Matcha Green Tea or Sencha Green Tea. Drinking an Earl Gray black tea with white chocolate treats will make the candy seem even smoother and creamier. Our chocolate covered coffee bean crunch may seem like an unlikely item to pair with tea, but in fact it tastes delicious when enjoyed with a rich mug of dark, black tea such as rooibos. Enjoy the white chocolate coffee bean crunch with less concentrated tea, and the dark and milk chocolate varieties with strongly brewed mugs. 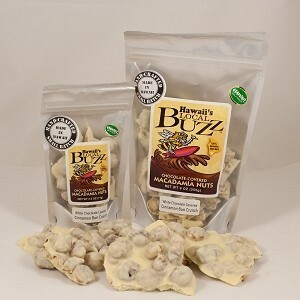 Our chocolate treats from Hawaii are made with real Hawaiian-grown coffee beans and macadamia nuts, covered in genuine Guittard chocolate. Made by hand in small batches, these treats are satisfying from the first bite to the last, especially when paired with tea. 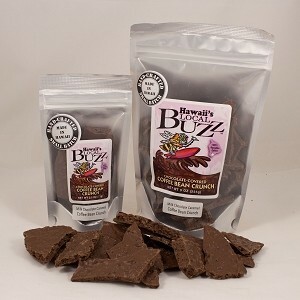 Visit Hawaii’s Local Buzz to learn more about our products, which include raw Hawaiian honey, coffee and more.